"The Other Side of the Moon: Dead Beginnings and Dead Ends"
This article is solicited as a response to the un-cited massive agglomeration of ideas from different schools of thought by the Prime Minister of Ethiopia Mr. Meles on “Dead Ends and New Beginnings”. This article employs a sort of discourse analysis approach. In his article, Meles envisages to make a paradigm shift towards conceiving and give birth of developmental state (henceforth DS) in Ethiopia, if not in Africa. May it be feasible? What is wrong with the previous neo-liberal approach? Who is going to be accountable? In one of my previous papers, I showed that the form of state in Ethiopia is largely a Neo- Patrimonial state and should be transformed into a type of developmental state if any reform can be successful. In fact, at the first place it requires a radical reform within the ruling party and the state. This makes it merely a dream, as the Meles-dominated parties and the state have been skeptical for any restructuring. I favor dynamism and I’m against dogmatism, but the most important of them is the intention behind. If the intention is positive, even dogmatism can be Ok. I am not personally new to the unpredictable and ever changing views of Meles, albeit I recognize that it is a big stride forward to see an “intellectual” leader like him in Ethiopia who is capable to write his arguments in a scientific and acceptable fashion in the form of a book. This can be considered as the bright side of a Moon and hence a breakthrough for a renaissance in Ethiopia if the intention is truly positive. However, it is also of immense importance to see at the other dark side of the Moon, Meles’s work. 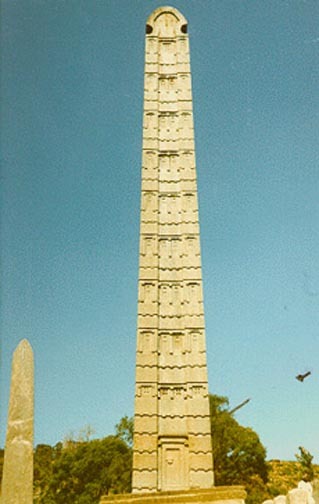 In actual sense, if the state in Ethiopia wants to be a successful development interventionist through creating social capital, technological capability accumulation, equity, and attract FDI, Meles and its party EPRDF must start to give recognition to and work together with the Ethiopian people particularly with the educated class who must take the leading role in the development efforts of the country. The state should also be an interventionist to endorse an endogenous intellectual revolution by breaking the ever existing divorce between the state and the educated elite in Ethiopia. I may agree with Meles that development is more of a political process than technocratic. If we agree so, then it implies that a political reform should come first, which I believe can be the only cure to the complicated problem in Ethiopia. I would also like to emphasize on the importance of democratic accountability for any government failures on the past development efforts before shifting the gear to the next lever of development approach. If not, the essence of the rule of law will be undermined leading to a vicious circle of arbitrariness, bad governance, and at most anarchism. Ignorance of law is no excuse “sir”! In the contemporary public policy debate, the chance of success or failure of any policy may not be determined by the type and quality of the policy on paper. Currently, policy mainstream is very similar and tends to become a standard every where. The difference predominantly lies in its implementation. In fact, the way a policy is formulated inevitably conditions its chance of success. For instance, a policy imposed by the uncontested will of politicians is likely to fail as it may face resistance from any segment of the society at any stage of its implementation. Often, this has been the case in Ethiopia. On the other hand, a policy which is formulated by the full and free participation of the concerned actors and accepted ideally has a better chance of success as the people may develop a sense of ownership and commitment. Particularly, in a country like Ethiopia where there are enormous public dissatisfactions, a culture of patronage in political power, lack of deeply developed medium of trust, and absence of culturally shared understandings, only democratic way of formulating policies may be a better alternative to reconcile such conflicting interests. After all, who are politicians to impose on the people? Therefore, if the most important element of a policy is its implementation, the failure of the neo-liberal reform in Ethiopia may not be attributed to the inherent flaws that embody that school of thought. Many countries prosper by adopting the neo-liberal approach. This shows that the government should rather consider it self as part of the problem, clearly evaluate the implementation process of its policies, and identify its weaknesses. The leaders must be ready to be accountable for their failure as well. The state can not actually behave as a solution, unless, in the first place, it accepts itself as a cause for the problem. Undoubtedly, a government that undermines accountability would fail to accept itself as a cause for a problem and would only be acting superficially. The current Ethiopian situation is a case in point. If we blame the policies for our failure, then no policy will guarantee us success. And we will keep switching between different schools of thought and continue to fool ourselves as what has been done so far. However, I don’t think that Meles can miss this challenge unless he wants to fool us by constantly switching our attention from one school of thought to another as a means of prolonging his stay in office and as a tool to escape accountability. Life is short; one can’t cheat for ever. I feel able to argue that even though the neo-liberal ideology may preferably need to be replaced by a developmental state, the former approach could have given us much more fruits than we achieved if it were implemented effectively. Anyway, we know that the idea of DS is not an innovation of Meles. Was not DS proposed by the TPLF descendants Like Siye, Tewelde and Gebru, and was a cause for them to be labeled as undemocratic that made them a prey of the Predatory Meles? The Ethiopian people, particularly the poor have also been needy for government intervention as a correcting mechanism for market failures although it has been condemned unheard. Anyhow, if managed properly and as long as there is genuine move towards it, why not, DS can also be a path for growth. But, it should be noted that like any other policy, DS is also a means and not an end by it self. Its chance of success depends on numerous intricate factors. The extent to which it can serve as a ladder for development depends on the extent to which we successfully identify such factors and work to fulfill them. But how suitable is the actual context/scenario in the prevailing Ethiopia in which DS is intended to be realized? In the real world, the practice matters largely, not the normative hopes. The existing dynamism often shapes the future. Therefore, real analysis of the existing scenario in Ethiopia decides the practicability of democratic DS in the future Ethiopia; not the wish and ambition of writers who so ever may be. An empirical research is far better than ambition in policy making. These have not been pleasant states by either liberal or socialist standard. The above checklists are going to be used to examine and understand the extent to which the existing scenario in Ethiopia is conducive for a DS to be realized. I shall treat the above points one by one very briefly as follows. The government in Ethiopia has already spent more than 16 years and may even go up to 30 years in power, but the development records so far does not promise a miracle perhaps even after the next 13 years. At many stages and occasions in history, the government of TPLF/EPRDF has been a predatory and has swallowed many of our nationalist, purposeful, and determined leaders. Now we are remaining with leaders who compromised our national interest by promoting their narrow group interests. The relative autonomy of the political leaders and their institutions is only nominal. In Ethiopia, rule of law has continuously been violated. Proclamations that violate basic human rights have been enacted over night merely to revenge individuals. There is a common consensus that the Prime Minister is every thing; he is the chief of the executive, chief of the judiciary, chief of the legislative, chief of the military, chief of the ruling party, etc. What an absolute hegemony! This is what we call the typical Neo-Patrimonial state. Meles is the patron, and others his clients revolving around the orbit of his clique. In effect, we do not have developmental elites with commensurate autonomy that can check and balance Meles’s power. Competence and achievement have been undermined in the Ethiopian bureaucracy. Instead, personal ties, political loyalty and nepotism have been rules of the game in appointment and promotion. Hence, the bureaucracy is fully engaged in the network of rent-seeking acting as the pioneer of patronage. On the other hand, the Ethiopian bureaucracy is highly insulated from its surrounding social structure. Access to every door in the bureaucracy is a practical challenge to many people, particularly the poor. Leaders of public institutions in Ethiopia are characterized by exclusiveness. Unlike the practice of the developmental states in other countries, the power, authority and relative autonomy of the current state has been deteriorating from time to time let alone to be established at an early point in its developmental history. Now, national and foreign capital has already become important and potentially influential. As a result, Meles often behaves as a parasite and agent of WB, IMF, and donors. So, the existing government lacks practical power for self-determination and to guard national interest. EPRDF has already lost this golden opportunity. The existing government of Ethiopia only best fits this last criterion, as it has not been pleasant state by either liberal or socialist standard including for its founders. From the above analysis, one wonders if Meles’s rhetoric for DS can be realized in a vacuum where all of the underlying components of a DS commonly shared by all developmental states in many countries are entirely missing in the current Ethiopia. Thus, DS has no fertile ground in Ethiopia to prosper even if we are dreaming for it. In the first place, an entire overhaul at a party and government level is a must. Without such a complete political reform, it seems reasonable to imagine that Meles is preaching about the creation of DS to justify its neo-patrimonial state and/or predatory state, which is principally characterized only by the 7th feature of the developmental state. May I remind Meles the Amharic proverb “fiyel wedih kizimzim wedia” meaning to indicate two highly polarized ideas? Looking at the contents of Meles’s article, one can identify a lot of seemingly logical but in essence with deliberately covert conflicting and unrealistic ideas. For instance, as a means of establishing democratic DS, Meles argued that the developmental state in Ethiopia seeks to form a coalition with the majority, the rural peasantry and he said that it may perhaps include the middle class (as optional). Even if we need to clearly define who is the middle class in the Ethiopian context, no matter to which class it may belong, the educated-elite class and the bureaucracy should necessarily take a clear role in the structure of the developmental state in Ethiopia as they inevitably bridge the government’s development policies with the people in the outreach. Meles can not afford to exclude these classes both from the perspective of its practical necessity for successful policy implementation, and to attain democratic stability in the country. Meles tends to overlook and/or deliberately ignore the educated class and the bureaucracy which he often labeled them as classes that can not align themselves with the government’s imposed agendas. This is contradictory with the experience of almost all the developmental states that appeared in history and had enjoyed embodied autonomy by sharing the leading role of their development goals with the educated class and their bureaucracy. All the developmental states in common had embodied autonomy within the framework of their respective social structure which they used it as an inbuilt self correcting mechanism in detecting any flaws in implementing their development policies. Some writers also argue that the bureaucracy was insulated from its surrounding in the sense that it was not linked to clientele and rent-seeking networks in the society. But all writers agree that the educated class and the bureaucracy played the pivotal role in leading development in all of the developmental states existed in history. Meles should stop to consider only himself and his followers as the true leaders of development and others invariably rent-seekers, if he is really committed to realize development in Ethiopia. Every citizen likes his country, and no one shall be condemned unheard “sir”. Further, Meles’s argument about the possibility of establishing democratic developmental state seems very interesting if we take it at its face value. He argued that it is possible to create a developmental state by creating a coalition with the peasantry (he didn’t say the poor) and thereby securing a majority vote from them. Why Meles didn’t say coalition with the poor? Is it by chance? No, it is intentionally. Logically, any genuinely committed developmental leader shall be indebted to address the agendas of all segments of its society including the destitute urban people and the poor peasant of course if consensus on development policies is to be attained, if peace and stability is to be realized and if in effect such policies have to be implemented successfully. It should be noted however that I don’t mean prioritizing policies is impossible. But, since Meles’s concern is about acquiring majority vote during election to come to power, it is not surprising that he ignored to analyze the agendas and roles of the different segments of its people in the developmental sate he is envisaging to see. Consequently, Meles’s covert agenda seems to gain large number of votes from the peasantry merely to stay in power, and not fundamentally to realize a real development. To this end, if we have to refer to the contemporary debate about democracy, it is not only about being represented by the majority, but mainly about securing the right of the minority and individuals, and the rule of law after coming to power. Therefore, securing majority vote through fair election and securing minority and individual rights after coming to power are two faces of the same coin (real democracy). Getting rid off either of these sides of democracy would be a sufficient condition to be undemocratic. In essence, Meles seems dedicated to serve only the first face of democracy, and hence undemocratic. This is consistent with his autocratic and dictatorial leadership from which the Ethiopian people have been suffering for the last 16 years of his colony. What a shame! Let us continue to extract Meles’s obscured motive of staying in power from his arguments. On one hand, he argued that the developmental state in Ethiopia can be social democratic. This might be said as it has been relatively easy to gain votes from the majority of the poor peasantry in the remote colonies of cadres by using different sanctions like aid, and delayed/denial of justice in the rural Ethiopia where the reach of a third party like the WB, IMF and Human Rights Watch Dogs is a practical impossibility. On the other hand, Meles said that it might be a must to be undemocratic if one has to effectively fight and win patronage and rent-seeking behaviors. This argument is at the center of Meles’s purpose for it can help him to defend his prevalent undemocratic practices against any form of opposition. In fact, Meles has not analyzed the forms of patronage and rent-seeking practices in Ethiopia in specific terms. Because, the problem of clientelism in Ethiopia is manifested in both vertical and horizontal forms, and deeply linked with almost all of the politicians at any level including Meles himself. In this respect, patronage and rent-seeking practices are rampant within members of the central committee (CC) of TPLF (Tigray People’s Liberation Front) which is dominated by Meles. For instance, out of the 45 members of the CC of TPLF, 12 are wives and husbands, not to mention the relatives by blood . It is also a public knowledge that there are a number of firms registered as share companies by the name of these members of TPLF’s CC whose revenues and expenses have never been audited and reported to any organ. This issue has long been a mysterious to every citizen including members of the TPLF itself where internal party democracy has always deteriorated and has reached parasitism. Surprisingly, any member of TPLF obtains no receipt for monthly membership fee; and no report has been made about the financial status of the party to its members in its history. If no party-democracy and transparency, how come national democracy “sir”? So, where is the moral ground for Meles to preach the gospel of democracy, growth and justice, and to pretend as an ambassador of development? I left the answer for the rational reader him/herself. But, as I have tried to explain in my other article about “Political Commitment….In Ethiopia”, the strong family-based and blood-tied coalition among the Ethiopian politicians can be best explained by applying the public choice theory where every politician in Ethiopia is searching for a way out there to maximize his/her benefit at the expense of the deprived poor. Moreover, from his argument still now it seems important for Meles to stay undemocratic after winning any election. Because, it will help him to issue proclamations over night that may even contradict with fundamental human rights such as “the presumption of innocence until proven guilty” under the cover of fighting patronage, but practically aimed to attack its opponents. This has been done to the free X-Defense Minister Mr. Siye Abraha who is suffering in a pre-trial detention for about 7 years. In a true democracy, there is no mentality for revenge “sir”. Meles and his wife Azeb, Ambassador Tewelde and his wife Roman, Tsegay Berhe and his wife Kidisan Nega, Abay Woldu and his wife Tirfu, Gobezay and his wife Kiros, and Abay Tsehaye and his former wife Monjorno, Arkebe’s wife is also a sister of another CC, Berhane G/Kristos, etc. All are heads of patron-client networks in the country.